The year of Nash’s birth is not certain but is likely 1768. His great grandparents, Pierre and Judith Vril Le Grand, were Huguenots who settled in the Richmond area of colonial Virginia after fleeing France following the revocation of the Edict of Nantes. Nash’s parents, Peter and his second wife Lucy Nash, resided in Prince Edward County on a farm located within two miles of Hampden-Sydney College. His father was a burgess of Prince Edward County serving in five assemblies between 1761 and 1775. His mother had grown up in an affluent family and was an exemplary Christian, however her walk in grace was challenged by many difficulties most of which were caused by her husband’s irresponsibility and uncontrolled temper. Nash, whose given name was his mother’s maiden name, was relieved from his difficult home situation when he was taken in by his uncle, Colonel John Nash. Young Nash found in his new family a stable home and because of his uncle’s wealth he was able to have a good education. Nash Le Grand was a handsome youth who was polite and agreeable with others, when he chose to be so, but he could also be contrary, aloof, conniving, and stern. With dark brown hair, a high forehead, expressive eyes, and a pleasing voice, he was a popular conversationalist with those he deemed acceptable company. He also had some particularly bad habits such as the use of profanity and was adept at foolishness and pulling pranks. He attended nearby Hampden-Sydney College where in the spring of 1787 a revival took place on campus and in the surrounding community. The last thing Nash Le Grand wanted was a change from his thoughtless and self indulging ways, so he distanced himself from campus by hiding at home. Despite his seclusion, he received word that some of his friends had been influenced by the revival services. Thoughts of his colleagues having their lives changed led to reflection upon his own spiritual condition. At this time, Rev. Drury Lacy spent a night at Col. Nash’s home. Given the limitations of space, Lacy roomed with Nash. During the night neither Nash nor his guest could sleep so they conversed regarding the gospel until the dialogue ended with Nash leaving the room to go to the garden where he prayed for forgiveness of his sins. At the time, he had been studying to be a physician but his conversion led him to abandon medicine so he could prepare for the ministry. Nash Le Grand studied theology under the direction of Hampden-Sydney College’s president, John Blair Smith (1756-1799). Smith was one of the sons of Rev. Robert Smith, D.D., who was moderator of the second meeting of the PCUSA General Assembly in 1790. John Blair Smith was closely associated with the Nash family because he had married Col. Nash’s daughter, Elizabeth. At a presbytery meeting in Cumberland, October 10, 1788, Le Grand was examined for ministerial candidacy. After relating his Christian experience and desire to be a minister, he was added to the list of candidates. At the presbytery meeting the following April, Nash was licensed to preach the gospel. His pulpit presence, zeal, charisma, pleasing voice, physical appearance, and illustrative gestures worked together to make him a particularly popular speaker. Through his Christian commitment, Le Grand’s capabilities and presence were turned from collegiate foolishness and rowdiness to preaching. As soon as he was licensed Nash was invited by Rev. Henry Patillo to join him in a series of revivals in North Carolina. The duo began their work in Granville County, then they travelled into Orange County, then on to Caswell County, and finally the series concluded among settlements distributed along the Dan River. In October 1789, he left North Carolina to attend the meeting of the Presbytery of Hanover at Pisgah Church in Bedford County, Virginia. Word of his preaching ability was spreading because while attending the sessions he was sought for calls to several local churches. Even the Synod of Virginia offered him a call to become its missionary, but he instead became his presbytery’s missionary. It was reported to the PCUSA General Assembly, 1791, that Nash Le Grand had been a missionary of the Presbytery of Hanover since April 1790 during which time he had completed a circuit of 300 or more miles in the Shenandoah Valley counties of Bedford, Rockbridge, Botetourt, Montgomery, and Rockingham. Licentiate Le Grand’s next ministry took him to Frederick County. 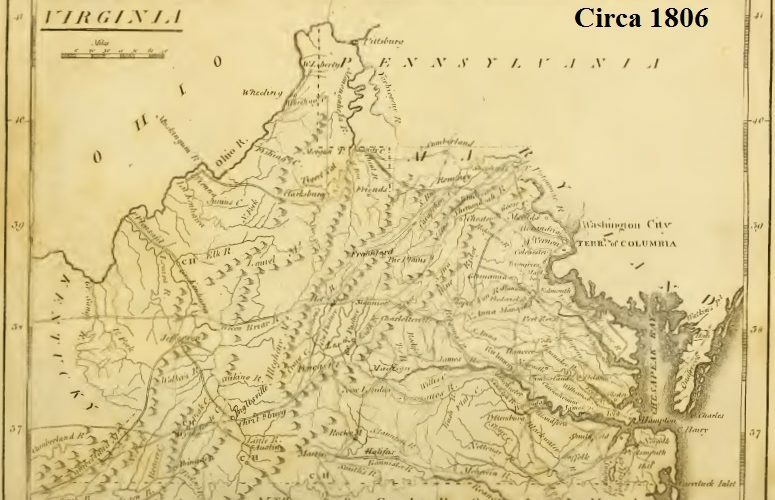 In Winchester, the Presbyterian congregation was not yet an organized church, but the nearby Opequon and Cedar Creek congregations were two of the oldest churches in Virginia. Mr. Le Grand began preaching alternately in all three churches. His style of preaching did not go over well with the Scotch-Irish Presbyterians that filled the services in Winchester. Tension developed within the congregation because an Irish clergyman, unnamed in the source, was opposing Le Grand’s ministry. The Winchester flock polarized in two with Le Grand’s sheep in one fold and the Irishman’s in the other. Adding to the division was a debate common at the time regarding the use of Watts’s psalms and hymns. Unfortunately, the situation deteriorated to the point that each group claimed to own the recently constructed meeting place and was locking the other out. Lexington Presbytery attempted to resolve the situation by having the two parties share the building with each group meeting at different times, but this plan did not work out well. The situation finally calmed when the Irish preacher left the ministry to become a lawyer. Although this left the Winchester meeting facility open for Le Grand and the congregation to worship, animosity between the groups was such that he believed it best to confine his work to the Opequon and Cedar Creek churches. Within a short time his missionary-supply work in the two churches came to an end when Licentiate Nash Le Grand accepted a pastoral call to the Opequon and Cedar Creek churches. He was examined by the Presbytery of Hanover and ordained at its meeting in Briery Church, April 2, 1791. His dual call not only settled him into pastoral ministry but within about three years he was married to Margaret Holmes who was a member of Cedar Creek. Margaret and Nash would have two sons and three daughters. As Pastor Le Grand continued his ministry, Margaret became quite ill with her condition declining for several months. When their fifth child was born the stress of delivery added to her frail condition led to her death. Nash was left without his loving wife, with five children, and no motherly care. It cannot be said for certain, but it appears that Margaret’s death devastated Rev. Le Grand. His physical health began to trouble him and his emotional condition often declined into deep depression. He believed that his condition made him unfit to continue shepherding a church. It was not uncommon in the day for widows and widowers to distribute their children among friends and relatives due to their inability to provide not only physical needs but also full parental direction, so Rev. Le Grand located homes for his children. It was Le Grand’s hope that through travelling, experiencing better climates, and viewing different locations his health would improve. However, after a year or so, he found his condition the same and he could not in good conscience return to the pulpits of Opequon and Cedar Creek, so he resigned. Nash Le Grand continued to experience reoccurring physical and emotional trials. He travelled and on occasion would preach as his health and spirits were invigorated. His wandering came to an end when he met and married Paulina Cabell Read who was the widow of Major Edmund Read. Mrs. Read had no children of her own and her husband had left a considerable estate for her use. The two were married and Rev. Le Grand gathered most of his children back from their scattered homes to live on the Read estate in Charlotte County. He was unable to take on a settled ministerial call, but he did travel short distances to fill vacant pulpits as he could. Likely out of the kindness and concern of the pastor of the local church, Clement Read, Le Grand was taken on as his assistant to help with his three-church ministry. Unfortunately, having two ministers did not work out well for the congregants because they polarized around them. The short-lived dual ministry was ended and Le Grand agreed not to preach in the area of Read’s church unless invited to do so. While attending to some business regarding property he owned in Winchester, Rev. Nash Le Grand became very ill and was taken in for an extended stay by his first wife’s brother. His condition deteriorated, Paulina was summoned, and she arrived about a week before Rev. Le Grand died in October 1814. His age at death was about 46 years. Despite availability of Paulina’s considerable funds for purchasing a grave marker, Nash was buried in an unmarked grave in the cemetery of the Old Stone Church in Winchester. Rev. Le Grand had enjoyed periods of fruitful preaching during his few decades of ministry, but the emotional devastation caused by Margaret’s death combined with his susceptibility to be confrontational in his ministry contributed to times of sadness and difficulty. Notes On February 23, 2017, I changed the sentence in the fourth paragraph in which Robert Smith, John Blair Smith’s father, was described as the moderator of the first meeting of the PCUSA General Assembly in 1789; I erred, Dr. Smith was moderator of the second in 1790. Drury Lacy’s grandson, Moses Drury Hoge, was the pastor of Second Presbyterian Church, Richmond, Virginia, for over 50 years.